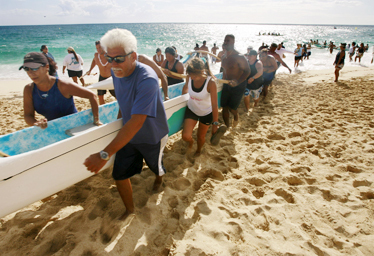 Kaneohe Canoe Club members pulled their canoe out of the water after a day of racing at the Na Keiki O Ka Mo'i Regatta held at Maili Beach Park yesterday. While it was much closer than the normal 20- to 30-point margin of victory the Kaneohe Canoe Club usually experiences, a win is a win. Kaneohe claimed the Na Ohana O Na Hui Wa'a Na Keiki O Ka Moi Regatta in rough, choppy water off Ma'ili Beach yesterday with 69 points on eight wins. The club has now won the AAA (25-plus crews) division in all seven regattas thus far. "That's the name of the game, whether you win by one point or 20 or 30, it doesn't matter," said Kaneohe coach Clint Anderson. "The main thing is we had fun, and we can take this momentum into the championships." After 35 of the regatta's 39 events, Kaneohe trailed Manu O Ke Kai 63-61. But after the clubs moved into a tie with 64 points after 38 races, the regatta came down to the afternoon's final contest: the mixed open six race. Kaneohe paddled to victory in 4 minutes, 29.19 seconds and clinched the regatta. "We needed the points, and Coach (Anderson) told us 'First or second would be nice,' " said Travis Hawkins of the winning crew. "I told him we'd get first no matter what, and we had the pressure of the entire day on our shoulders. It's a lot to live up to, but the whole club pushed us through." Manu O Ke Kai finished a close second with 64 points, while Na Keiki O Ka Moi (50) and Lokahi (34) rounded out the large-club division. The senior men of Manu O Ke Kai played an important role in the club's strong performance, claiming victory in the 1.5-mile course in 12 minutes, 31.06 seconds. "It was really choppy going out -- that's the worst I've seen it," said Robert Pactol, who paddled in the winning boat's fourth seat. "When we got out to the first turn, we had ankle-deep water in the boat, so they had me bail at the turn. We had a lot of water in the boat. It was pretty hard going out (against the waves), but we had a good crew, so that made it easier." 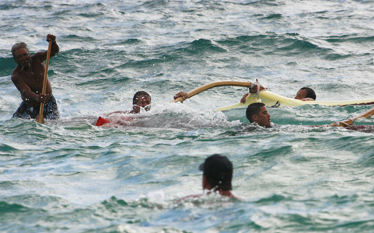 Crew members from Hawaiian Outrigger brought their canoe to shore after it hulied at yesterday's regatta at Maili Beach. Kaneohe Canoe Club member Jimbo Neumann, who is blind, was guided by Cheryl Farias after competing yesterday. Heading into the regatta, Anderson decided to give some of his less-experienced keiki the chance to race, rather than stacking his crews. Anderson said the club will not participate in Sunday's race in Waikiki because it will be having an annual party on the sandbars in Kaneohe Bay. He hopes the experience will help his paddlers bond and celebrate their success heading into the Hui Wa'a championships on July 21 at Ke'ehi Lagoon. Despite not crossing the line as part of a winning crew, one of Kaneohe's paddlers proved the day was a success regardless of where he finished. Jimbo Neumann has been blind in both eyes since 1985 after suffering from the effects of spinal meningitis. He paddled in his youth until he lost his sight in his senior year of high school, 22 years ago. He just started paddling again with the club's masters crew last season, partly to keep pace with his daughter Kapua, a member of Kaneohe's undefeated girls 15 crew. Neumann's crew placed seventh yesterday, but finished ahead of four other canoes. "It was kind of bumpy, getting thrown to the left and right; it was choppy," Neumann said. "Keeping in unison with the strokes, I get plenty of help from the steersman with my timing. If I fall off (pace), he corrects me with calls of the hits (of the paddles). Also, I rely on the movement and feeling the boat, the rhythm of waves. I let the rhythm be my eyesight"
Koa Kai claimed the AA (13-plus crews) division with 47 points. The Waikiki Beach Boys came in a close second with 45 points, followed by Alapa Hoe with 14. It was the Koa Kai children's program -- of which the Beach Boys have none -- that helped the medium-sized club eke out the win. The girls 14-and-under crew won its race, and the five points that came with the victory proved just enough. The Beach Boys claimed seven race wins, and received the majority of their points from their dominant women's program. Waikiki got wins from its women's novice B, novice A, freshman, sophomore and senior crews. Kalihi Kai took the top spot among clubs with 12 crews or fewer, claiming the A Division with 19 points. Ka Mamalahoe (18), Kamehameha (6) and I Mua (5) rounded out the division. The Oahu Hawaiian Canoe Racing Association took the weekend off after holding its annual Walter J. MacFarlane Regatta last Wednesday. The OHCRA clubs return to action on Sunday for the John D. Kaupiko Regatta at Keehi Lagoon. That race also marks the final regular-season contest leading up to the organization's championship regatta on July 22 at Ke'ehi Lagoon.